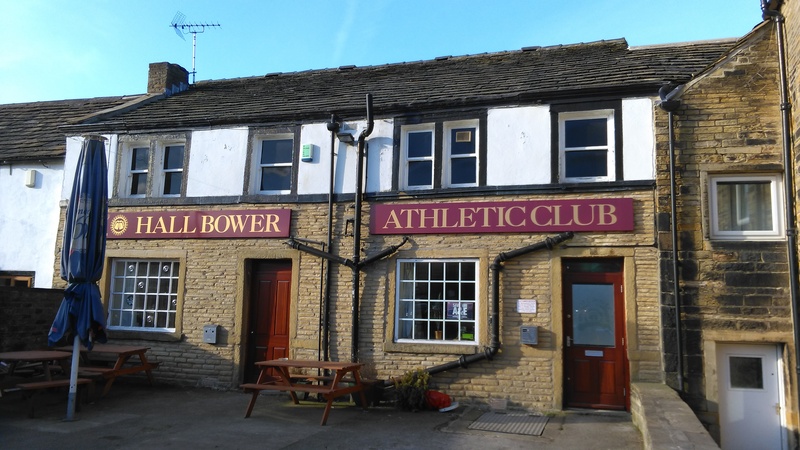 Hall Bower Athletic Club is a small private members club in the lovely semi-rural location of Hall Bower, below Castle Hill, Huddersfield. It is run entirely by volunteers from the local community and hosts an annual festival in July. Open from 8:30pm-11.00pm, Tuesday to Saturday, 3.00pm-7.00pm, Sunday and from 4.00pm on the 4th Friday of each month. As of late October’18 we will be closed on Mondays unless otherwise advertised. Other variations will be announced on our news page which you can follow with automatic email notifications (see News page). The Club can also cater for meetings and parties, both day and night by prior arrangement through a member of the Club. Availability will depend on a number of factors including times, dates, scale and volunteer staff. We have facilities for playing 8-ball Pool, table tennis, darts, dominos and cards and there are Sky Sports channels available for members. There is a full range of beers, soft drinks, wines and spirits, with a good selection of gins, all at very reasonable prices.